Whether you are planning a corporate gala event for hundreds of guests or scheduling a private wedding for a few dozen close friends and family, there are a few things which every good function has in common. Here are the five key ingredients which will help take your event from a drab, unremarkable affair to an unforgettable night out. Quality audio equipment is essential to the success of any event. Whether you need to amplify the voice of a speaker or special guest, or simply want to provide music, sound will help ensure the right atmosphere and vibe. They say the way to a man’s heart is through his stomach, but women can also often be won over with excellent catering and a good meal. If your event is going to be going on for several hours then you should make sure to budget properly for food, to ensure that everyone has a pleasant night out. 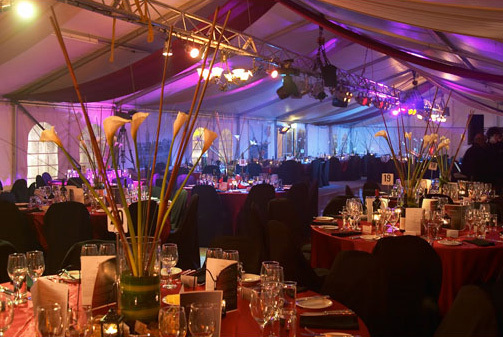 Good event lighting can go a long way towards amplifying the energy of the room and creating a memorable environment. Make sure to use dark spaces carefully and don’t be afraid to be inventive – logo and theme projections and other such effects can really revitalise an event space. Cramming all of your guests into a small area will make them feel uncomfortable and will generate an unpleasant atmosphere. You should consider using draping and the like to separate the venue, and be sure to leave plenty of room for people to make their way between the various areas. Good company can be great entertainment in its own right, but it can often pay to invest in live musicians or performers of some kind, depending on the style of event. Make sure that you have the right audio visual equipment on hand to ensure that the performance can be enjoyed by everyone in attendance. Get in touch now to see how we can help make your event a great success!